Sam and Sonia met in grade school and have pretty much know each other their whole lives. They are best friends and today was both of their birthdays. Every year for their birthday they make a trip up from New Jersey to their favorite seaside city - Portland, Maine (of course) to check out the local food and views. This year Sam had a little surprise that he wanted to share on their birthdays. Somehow he convinced Sonia to get up at 5:30 for a sun rise walk over the break water to Spring Point lighthouse. What a good salesman he is because when I arrived on location at 5:45 he was there in his car with Sonia snoozing in the passenger side. Talk about a good sport! I made like I was a nature photographer and rolled off with my huge camera bag ready for some sunrise shots. Sunrise was just before 6 am and soon I noticed Sam and Sonia walking towards the breakwater. I quickly switched out my wide angle lens to my 70-200 as stealthy as I could be. I was undercover but also needed to be close to the action and 200mm was my friend. I certainly didn't want to blow it by looking like I was there to photograph them. An then Sam made his move and it was perfect. Sunrise in Maine on a gorgeous April morning and a perfect memory for Sam and Sonia. This will forever be a very special place for them and I bet next year I might just find them at this exact location. The excitement was fresh in the air and Sam and Sonia joined me for a "real" engagement session for the next hour or so. Location: Spring Point Lighthouse, South Portland, ME. 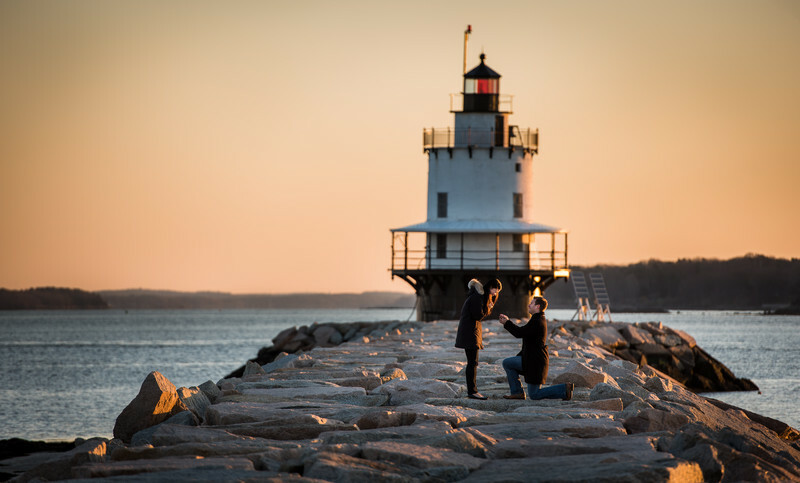 Keywords: engagement (9), Maine (69), Portland (33), Spring Point Lighthouse (3).